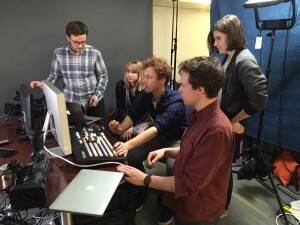 Nate Bartlett [front] instructs students from the NUDM Productions Committee on how to use the NewTek Tricaster. We’re excited to be working again with Northwestern University Dance Marathon, one of the largest student-run philanthropies in the nation, now in its 42nd year. This is the 12th Dance Marathon we’ve supported here at Northwestern Information Technology AMPS. from Nate Bartlett. The students will switch between three HD cameras, and a computer input providing graphics and videos. The live stream is an important component of the success of the event. It provides the ability for those who cannot dance for 30 hours straight (which is most of us) to watch comfortably from our homes, and more importantly to provide a view for those who are donating gifts to contribute to the fund-raising goals using the website.